Kazansky Cathedral is the major Cathedral of St.Petersburg of Our Lady of Kazan. 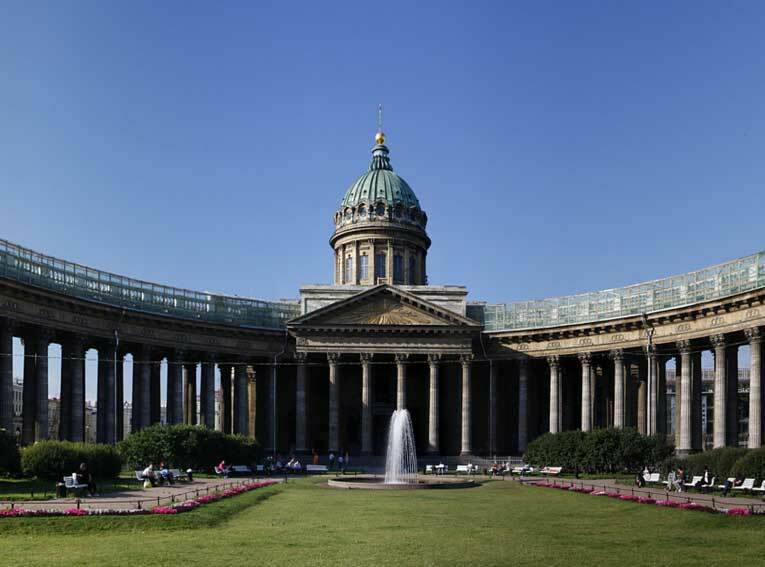 It was Paul's dream to create an impressive cathedral resembling San Pietro in Rome, and the Kazan Cathedral was the first building to appear in time of Alexander reign, who was eagerly fulfilling the wish of his father killed partly through the son's fault. Although it took ten years to build the Cathedral, not all the plans were fulfilled: the architect was determined to make two colonnades, a north opening on Nevsky, and the south on a residential area, but the later never appeared, while the north colonnade consisting of 96 thirteen-meter high Corinthian columns each weighing 28 tons and arranged in four rows produces a stunning impression. Consecrated in September 1811, the cathedral exquisitely combined sculptured and architectural forms, boasting statues of St.Andrew the Apostle, St.Vladimir, who brought Christianity to Russia, St.John the Baptist and St.Alexander Nevsky towering in the wall niches. As soon as the Napoleon's Grand Army invaded Russia and St.Petersburg regiments started leaving for the war, parting liturgies were served at the cathedral, and later on the Cathedral became the place where trophy banners and keys of the cities conquered by the Russian army were kept. On the 25th anniversary of the victory over Napoleon, bronze statues of Mikhail Kutuzov and Michael Barclay de Tolly, te two Russian victorious generals, created by Bris Orlovsky appeared in the cathedral square in 1837. An architectural masterpiece elegantly combining the elements of eclectics and Classicism, the azan Cathedral was used for divine services only until 1917, then it became the State property and housed the Museum of History of Religion and Atheism at the USSR Academy of Sciences from 1932 to 1999, when it was consecrated again and restored in its status of a major Cathedral.